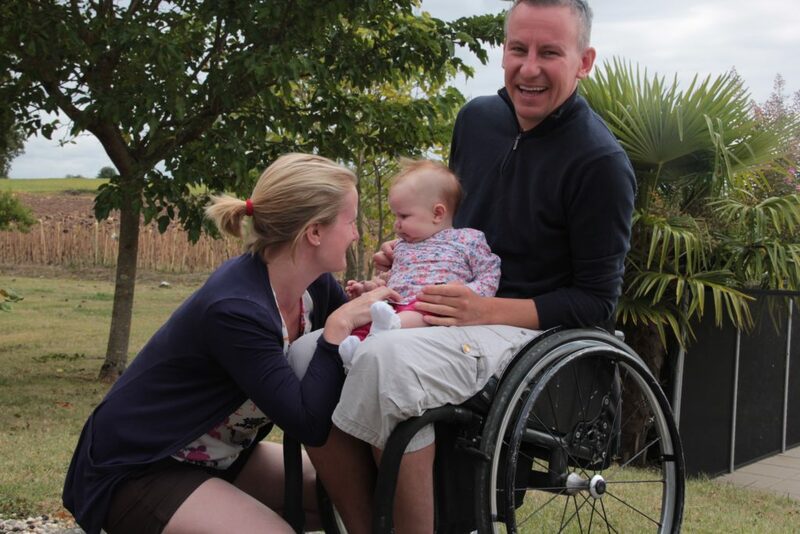 After you’ve taken care of the people closest to you, a gift in your will could make a huge difference to the futures of people with spinal cord injury. More and more people are choosing to support a charity in this way and leaving just 1% of your estate could have a big impact. Your legacy would live on into the future, supporting those living with spinal cord injury, and their families for generations to come. ”Making a will is something that’s been on the to-do list for a while. My wife, Helen, and I had a daughter in May last year and that prompted us to get on with it. I had a spinal cord injury as a result of a snow boarding accident in 2000 and Back Up helped me to get my life back on track. I went on a Multi Activity course soon after leaving hospital and the following year was back in the mountains skiing – something I never thought I would do again – it was amazing! Meeting Back Up was a game-changer for me – it opened my eyes to what was possible and I haven’t looked back. I started volunteering at Back Up and now work in the fundraising team. I feel lucky to work for such a brilliant organisation, I get to see first hand how we change peoples lives everyday and how the money raised goes such a long way. Helen worked at Back Up too which is how we met, so all in all I have a lot to thank them for. Andy M, Head of Outreach & Course. We want to be here for people aging with spinal cord injury and facing new challenges. We currently reach 80% of people with a spinal cord injury. Legacy gifts will enable us to reach more people. McMillan Williams Solicitors offer expert advice and can guide you through the process of preparing your will from start to finish, answering all your questions including those about inheritance tax. 20% discount on will-writing services available. Contact Andy Grant on 020 7186 0061 or at andy.grant@mwsolicitors.co.uk. The Goodwill Partnership visit you at your home to take your will instructions at a time convenient to you – daytime, evenings or weekends. They charge a low fixed price (£108 + VAT) however detailed your will, with no hidden costs or upsell of any other products. To arrange an appointment, call 0844 669 6148 or visit their website. Peace of Mind Services provide a will writing and estate planning service for individuals and families. They help you plan for both the unexpected and expected things that can happen in life. Contact Vanessa on 0845 264 1163 or at info@peaceofmindservices.co.uk to book your will appointment. We know that your family and loved ones come first and we won’t try to influence you to change that. We would love to hear if you decide to leave us a gift in your will, but completely understand if you would prefer to keep this private. If you leave a gift to us in your will, your gift will be used effectively so that people affected by spinal cord injury will benefit. We will handle any gift you leave us with care, sensitivity and respect. You can change your mind about leaving a gift in your will to Back Up at any time. We are always happy to answer any questions you have and to keep you updated in the way that suits you best. Just let us know what you prefer. Please see our leaving a legacy guide below to see how simple it is to include a gift to Back Up. We also have a template for a simple codicil. If you have any questions, please contact our Individual Giving Manager, Janet, by email or call her on 020 8875 6760 to talk things through.